When I was at Learning2015, I met some wonderful people and one of the people I had the privilege of spending some time with was Louise Pasterfield of the UK company Sponge, UK. Louise showed me some wonderful elearning solutions they’ve developed, shared with me her secrets for hiring good talent and provide great insights into the design and development of engaging instruction. Here is some of our conversation. Kapp: First can you explain what Sponge UK does? Pasterfield: We create custom-made absorbing elearning for large, often global organizations. Our focus is on making learning deeply absorbing so people connect with and apply what they learn. It’s why we’re called Sponge! Our clients come to us with a wide range of workplace challenges and we devise learning solutions to fit their exact needs. Using innovative approaches and advanced technologies, we’re helping organizations make a difference in the areas that matter most to them, such as skills development, leadership, induction, compliance and sales. We’re leading the way in emerging areas like elearning games, interactive video, animations and 3D simulations. Last year, we were named Elearning Development Company of the Year at the Elearning Awards. Kapp: You have a great backstory about how you started Sponge UK, can you share a little of that backstory? Pasterfield: You could say Sponge started almost by accident! Back in 2004, I was running a design and marketing company called Gusto. Rather unexpectedly, we won an elearning contract. I could see the potential of elearning, which was just starting to take off in the UK at that time, but more importantly I found it fascinating and wanted to learn more. So I set up Sponge as a side-line, initially. It proved a much more exciting industry and I found myself far more engaged by elearning than I had ever been with design and marketing. After a while, I decided to focus solely on Sponge and haven’t looked back. Kapp: What is the one or two things that you wish you had known when you first started your company? Pasterfield: I wish I had known from the outset how exciting I would find elearning – I would have started Sponge much sooner! The elearning world is changing so rapidly and the reality is that you come to whatever you are doing with what you know at the time. What makes it exciting is what you don’t know and want to find out. So rather than dwell on what I wish I had known, it is all about what are the next things I want to learn. For me right now I am fascinated by new developments in brain science, multi-device technologies to enhance learning and gamification to increase learner engagement and motivation. Kapp: You do some really creative things with elearning and especially game-based learning, can you please share some examples of what you’ve done? Can you share any examples with us? Pasterfield: Yes, I’d be delighted. We’ve really embraced game-based learning, not just because everyone is talking about it, but because we can see its potential. Here are some examples. The first example I’d like to share is a gamified challenge created for a National Health Service (NHS) organisation in the UK. Southern Health NHS Foundation Trust employs nurses, clinicians and other care staff who work out in the community rather than in hospitals. This is a game where people have to work against the clock to identify the fire hazards and fuel sources in the home of an elderly patient. Players get a score at the end and have the option to replay if they think they can do better. It’s built using Articulate Storyline 2 which we’ve pushed to its limits to maximise the gaming potential of the popular authoring tool. You can read more about this example here. 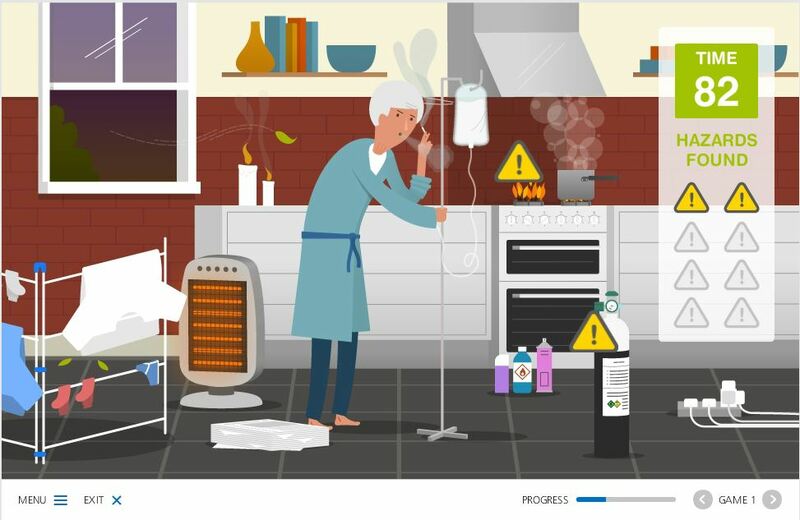 Game in which the learner needs to work against the clock to identify the fire hazards and fuel sources in the home of an elderly patient. We have been experimenting with the use of game-based learning to teach management and leadership skills. We could see their potential in supporting learning in soft skills, but hadn’t seen many examples of how it could work within a corporate setting. 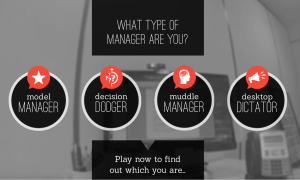 We created this interactive video game aimed at new managers on the subject of dealing with difficult conversations at work. The game has a strong narrative – a previously reliable worker has started turning up late and a newly appointed manager is asked to ‘deal with it’. Dealing with a co-worker in game developed by Sponge UK. 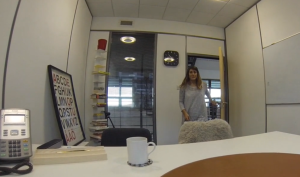 The video footage in the game is shot from the first person perspective, putting the player in the position of protagonist. They are faced with a number of decisions about how to deal with the wayward employee. 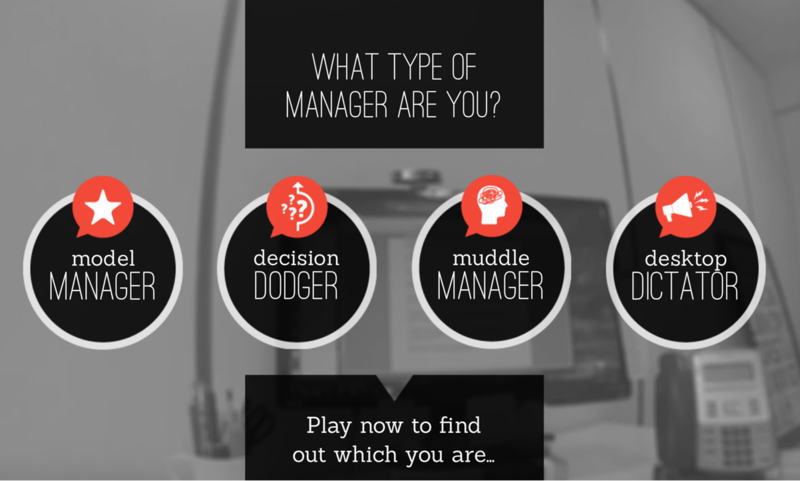 Play the game and see what type of manager you are! In the run up to the UK General Election, we created a public service game for first-time voters. The idea was to provide a fun way to engage young people in voting and debunk some of the myths about the experience of casting your vote at a polling station. Learning to vote, game by Sponge UK. The game is called 1st Past the Post. 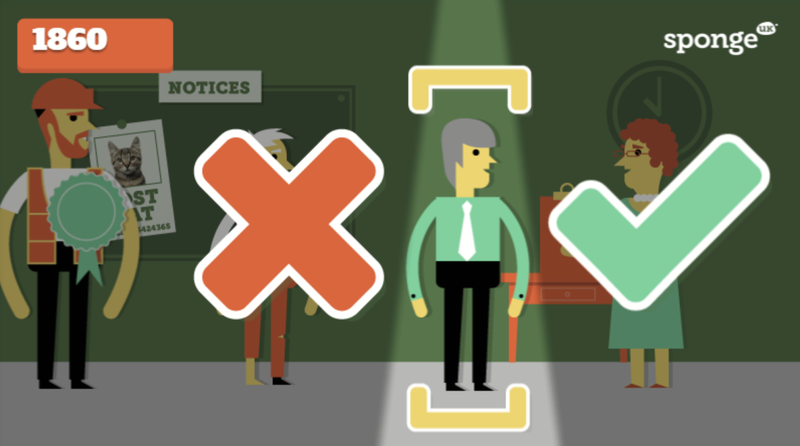 Play for yourself and see how much you know about UK polling station rules! Kapp: You showed me one of the most unique leaderboards I’ve ever seen, can you share how you developed the idea of the airplane, skydivers and on-the-ground topic? 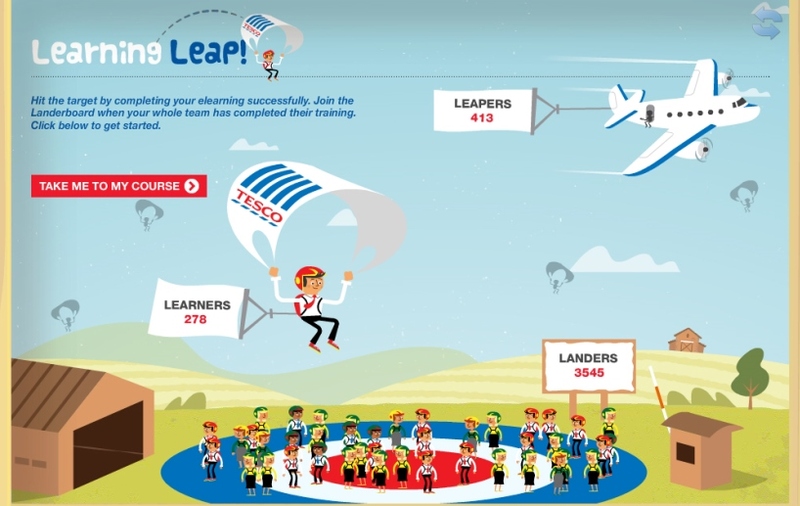 Pasterfield: This was part of a concept we created for the worldwide retailer, Tesco called Learning Leap. The company needed thousands of staff to do compliance training in a relatively short space of time. Previously, compliance courses at Tesco had not always been fully effective and lack of staff engagement had been a factor. 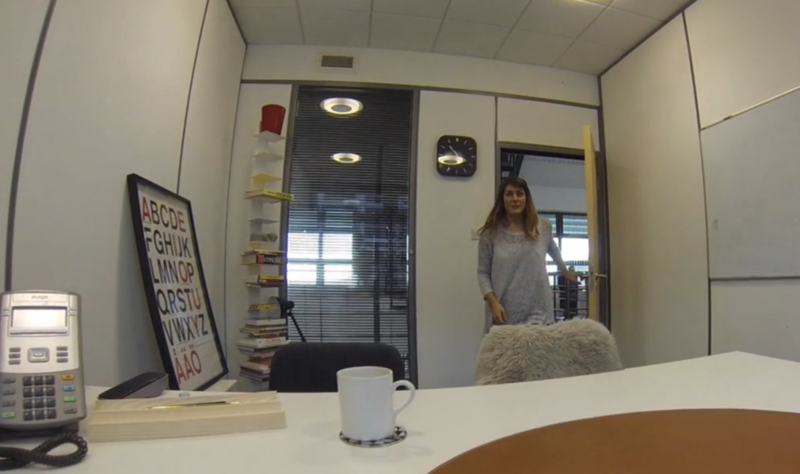 So we devised a whole learning campaign with its own real time leaderboard. Clever leaderboard created by Sponge UK. We needed a clear and fun visual representation of learning progress and came up with the skydiving analogy. The journey starts in the aeroplane with Leapers who have yet to start the training. Learners are those in the process of doing the training, represented as skydivers complete with a Tesco parachute. Finally, those who have completed the training are on the ground, known as Landers. Using the leaderboard, managers could see at a glance how many employees were at each stage of the training. This helped to encourage healthy competition among teams and motivate staff to complete. You can read more about the project here. Kapp: You travel a good deal between the United States and the United Kingdom, can you share what similarities and differences you see between the elearning and game market in the two countries? Pasterfield: I think there are similarities in terms of technology, design thinking and the corporate challenges we are trying to address. But in the UK there seems to be a greater willingness and cultural acceptance of trying out new things and taking some risks. Innovation is highly valued in the UK and we have found European businesses often look to the British elearning industry when they want something different. Kapp: You hire instructional designers, writers, artists to work at Sponge UK, what advice would you have for instructional design students who are just entering the field? Pasterfield: I’d definitely recommend it as a career and go as far as saying it’s one of the most exciting jobs around because you are constantly learning new things. My advice to new IDs would be focus on learners and find the best way to engage, excite and motivate them to learn. The most appropriate solution might be standard elearning or a serious game, but you need to appreciate the significant differences between the two. Although they both have the objective of learning something new, gamified elearning is about setting challenges to motivate learners. It uses intuitive design, fewer words and is visually led. Getting things wrong also plays a bigger part as it can be used as a vehicle for embedding learning. So IDs need to think in new ways when creating gamified elearning modules, actively research and play games themselves to learn.